The Wonder Valley Experimental Festival #6 takes place the evening of April 12 in Southern California. The sixth edition of the Wonder Valley Experimental Festival Returns to the Palms Restaurant and Bar in Wonder Valley on April 12, 2014. The Wonder Valley Experimental Festival is a day of sonic experimentation, home brew instruments, noise for the sake of noise and camaraderie with the sonic scientists there at The Palms to perform. Joining Emily at Wonder Valley Experimental will be Steuart Liebig, Wayne Peet, Brad Dutz and temporary Hi-Desert local, Lucio Menegon. The sets start at 5:00 PM Sharp! Wonder Valley Experimental Festival #6, April 12 2014, 5:00 PM, The Palms Restaurant and Bar. Patrick Breiner is a tenor saxophonist with an array of fresh ideas who performs regularly in Brooklyn and other parts of New York City. His animated performances and personal touch are designed to establish a connection with each individual member of the audience. He is gifted not only as an instrumentalist but aims to be “a performer who specializes in music.” His Sulde label, featuring the design of Connie Wang, brands his unique aesthetic in handmade packaging. Breiner leads and co-leads a number of innovative groups. His band Double Double, a quartet with two basses (Will McEvoy and Adam Hopkins) and drums (Flin van Hemmen), is set to release its debut record, Mileage at Korzo, April 1, at 9 pm. 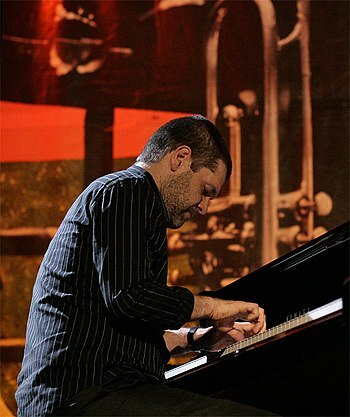 He has released three records with his solo act, Vartan Mamigonian. He also co-leads the group VAX set to release its second album, Count to VAX (vinyl only) at Downtown Music Gallery, March 30, 7 pm, before embarking on a European tour (details below). He also co-leads Premoticon (with a new record out last month), and Sons of Daughters. Featured pieces will include a solo piece by Richard Festinger, a duo for viola and marimba by Neil Kirkwood and the world premiere of a new piano trio by Sheree Clement. Raha performs live visuals to John Zorn’s Burroughs tribute INTERZONE. PROOFReaders Trio play music from Naked Lunch and other Ornette melodies. Zion80 returns to The Stone for two sets of music from John Zorn’s Book of Angels! Jennifer Choi plays the US premiere of the acoustic version of “Long Waves and Random Pulses,” which uses extended techniques, noise, and notes to evoke jammed radio signals. Cellist Felix Fan performs “Harmony of the Body-Machine,” for cello and machine sounds, “Four Roses” inspired by whiskey and detuned pianos (with Annie Gosfield on sampler) and new work. A reprise of this improvising trio, with Gosfield performing “ghost electronics,” a phantom electric bridge drawn from her extensive collection of altered cello and piano sounds. Kathleen Supové performs “Shattered Apparitions of the Western Wind.” Imagined as a hallucinatory duet with Claude Debussy, it couples Supové’s wild playing with distorted fragments of the prelude “What the West Wind Saw”, on site recordings of Hurricane Sandy, and lush Debussy harmonies. MIVOS quartet plays “The Blue Horse Walks on the Horizon,” inspired by codes used by resistance groups in WWII, and Olivia dePrato performs a piece for violin and satellites.